Readers of The Glade will know that I’ve spent the last couple of days effectively computer-less. I still haven’t decided on a solution to the issue, but at least I’ve diagnosed the problem. It seems that my power supply and motherboard/processor went, so I’ll be in the market for a new computer. The question will be when. In the meantime, I’m house-sitting for my mom and have hijacked her computer. I’ll probably be adopting my dad’s old one until I can make a decision on buying a new replacement (which will probably coincide with my next big paycheque, whenever that is). So I’ve been away from the blog for a couple of days, but I’ve had these photos sitting here with the intention of posting about them, and sending the post in to Festival of the Trees. The deadline is today, so I better get going! Despite that in winter trees are the one thing you can reliably find a lot of, I don’t actually make a lot of posts about them. The reason is that trees tend to be more background than point of interest, they blend in with the scenery – they are the scenery – so it’s easy for the eye to pass over them while looking for something smaller, or animated. Really, this is a huge injustice to trees. There are nearly 1000 species of trees native to North America north of Mexico, which is more than the number of bird species for the same area, and far more than the number of mammals. And that’s not including the introduced species! With such diversity, they really deserve more attention. But they tend to get overlooked. We may know our bird species upside down and back to front, we may know the names of our common butterflies, of all the mammals that wander through our yard. But when it comes to trees, I suspect most people would have trouble naming more than a few dozen wild (non-cultivated) species. I got up to about 50-60 and then started struggling to add more to the list. Probably it doesn’t help that Canada only has about 180 of those 1000 species, but even still, I felt I should know more. So I’m going to try to make a point of highlighting a tree species at least once a month. This month I selected Eastern White Pine, Pinus strobus. Part of the reason for this choice is that this happens to be my favourite species of conifer, towering and majestic, and richly scented. 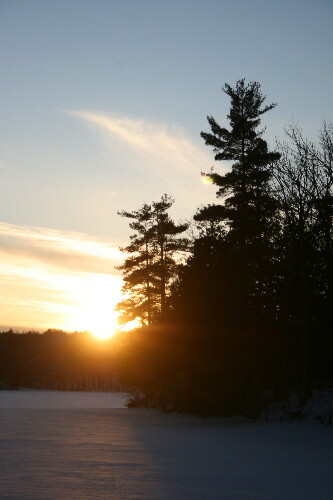 However, I also chose it because winter really is the best time for observing and appreciating White Pines. They are the tallest tree found in eastern North America, growing up to 70 meters (230 ft) in virgin forests. Since most virgin forest has been logged over the past couple of centuries, very few individuals now reach that height. Most are less than 50 m (160 ft). Even still, they tower above the surrounding canopy. Of the deciduous trees in our forests here, Sugar Maples may only reach 35 m, and White Oaks are even shorter, at 25 m on average. White Pines can live up to 400 years old and beyond, but most throughout eastern North America are probably less than 200 years, having only grown since previously cleared agricultural or logged lands have had the opportunity to return to forest. Many of those huge virgin trees, particularly along the Great Lakes, were logged for ships’ masts. They’re a relatively fast-growing species, for evergreens, at 2-3 feet per year on average when given good conditions, so even some of the very tall ones around here may be less than 80 years old. In the summer, despite their height, they blend in more with the rest of the green landscape, but in the winter, when the deciduous trees around them have lost their leaves, they really stand out and catch your eye. 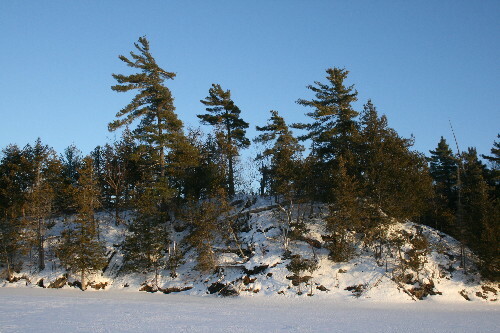 The White Pines around here all grow along the edges of the lakes, or on ridges. I notice that on Kingsford they tend to be positioned mostly along the eastern shore of the lake, with a western exposure. I have to think that microclimate plays into this – that is, the very local conditions that can vary from one spot to another even within the same region or ecosystem. In this case, I suspect that since most of our weather comes from the west and blows eastward, the western shore is more exposed to harsh conditions in the winter. Presumably this affects either the soil condition there or the humidity; I would think the cold dry winds during the winter would have a desiccating effect on the trees and landscape. 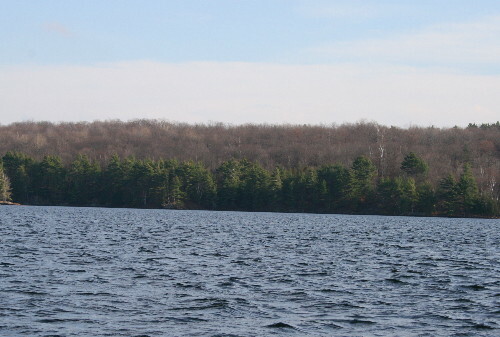 Possibly the conifers such as the White Pine and White Cedar that line the lakes are more well-adapted to dealing with these things than the deciduous trees; certainly White Pines are better at surviving in exposed landscapes such as granite outcrops. The other possibility is that the eastern shore and ridgetops receive more sunlight than the western. 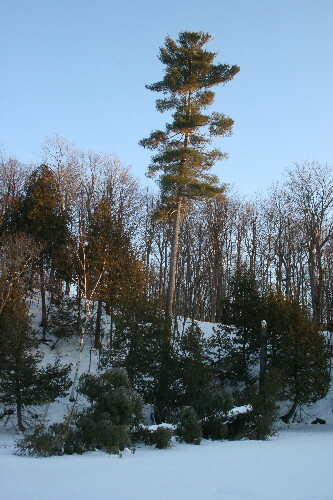 Though they can tolerate some shade as seedlings, White Pines only thrive and grow when given partial to full sunlight. One of these pair looks like it came down recently. I wonder if it was during the big windstorm we had a little while ago. It was obviously after the ice had frozen. It could have been weakened by insects, as there are a number that target pines, including a bark beetle that will actually bore into living trees and slowly kill them. Or it could simply have been in the way of a rather forceful and unfortunately located gust. I took advantage of the downed top to get a few photos of bits I might not otherwise be able to reach. The cones tend to grow near the tops of the trees, which, on these giants, is a long ways up. They can be anywhere from 3 to 6 inches long. When the seeds are mature the scales open and they drop out, to be scattered on the wind. However, often before they make it that far birds will find and forage on the cones. The remarkable White-winged and Red Crossbills have bills specifically adapted to prying open the scales of pine and spruce cones before they’re fully mature and opened – thus getting at the rich food source hidden inside before it’s lost to the wind. We’ve heard crossbills around our area on occasion, but haven’t seen any by the house. We’re on the western shore, and don’t have very many evergreens nearby; the birds are probably sticking to the far shore where the cone crops are. Cone crops peak every 3 to 5 years, and crossbills will wander according to where the crop has peaked. Since different areas and populations peak in different years, the crossbills always have somewhere to go for food, but they’re found in large numbers in any given area on a more cyclical basis. Pines are evergreen, meaning that they retain their “leaves” year-round rather than dropping them in the fall for the winter. That doesn’t mean that their needles last forever, however. The needles on most pines, if they survive being eaten by insects, only last for about 18 months or so before dying and being dropped and replaced. This is the reason for that thick bed of orange-brown needles underneath pine trees. 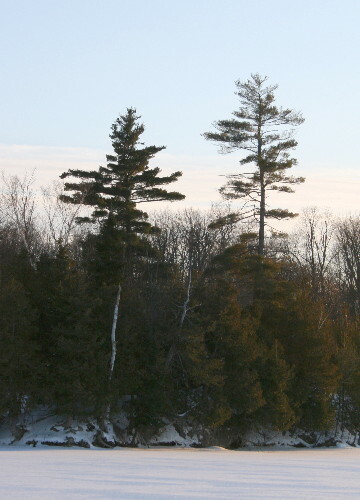 White Pines can be told from other pines by their needles. 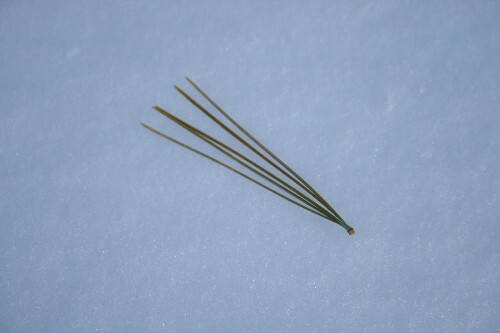 Pines usually grow their needles in clumps, bound together at the base. White Pines usually grow in clumps of five, while Red Pines (the other common pine around here) only have two needles per clump. Red also tend to be longer than White. Last night, while watching The Nature of Things, my mom and I observed that David Suzuki has really become the face of environmental issues in Canada (he’s an amazing individual, incidentally, for those who aren’t familiar with him). 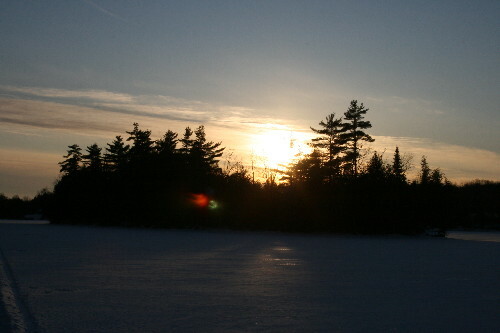 In a similar way, White Pines are probably the personification of the Wild North and Cottage Country. The species figures prominently in the paintings of Canada’s famous Group of Seven, such as White Pine by A.J. Casson or Stormy Weather, Georgian Bay by Frederick Varley. There are cottages, resorts, farms, and other establishments named after the trees (interestingly, the couple of links I clicked through to turned out to be for places in eastern Ontario). It’s the provincial tree of Ontario and the state tree of both Maine and Michigan. The state flag of Vermont bears White Pine springs alongside the emblem. The Iroquois called their neighbours (the Algonquians) the ratirontaks (Adirondacks), meaning “tree-eaters”, for their habit of using the soft inner bark of the Tree of Great Peace as food in harsh winters when food was scarce. When dried and pounded, this layer can be used as a flour or starchy substitute. 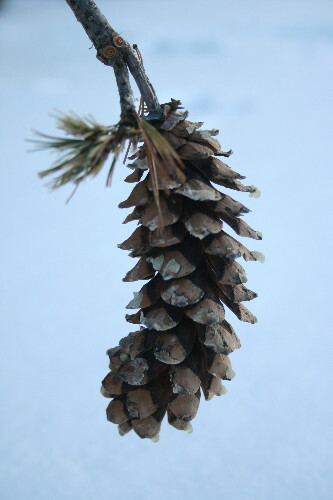 Young cones were often stewed with meat by the Ojibwe to add a sweet flavour. The Chippewa would use the tree’s sap to treat gangrenous wounds. It can also be processed to produce turpentine. The sticky resin was used as waterproofing for baskets and boats. 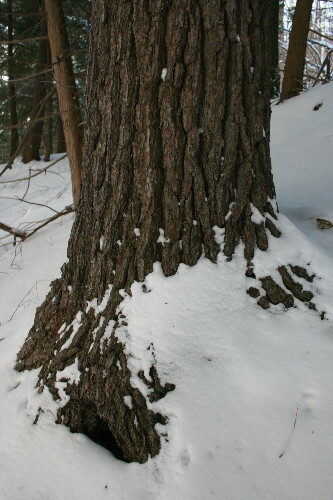 Its official name is Eastern White Pine, but it tends to be referred to simply as White Pine. It’s also sometimes called Northern White Pine or Soft Pine, and sometimes Weymouth Pine, particularly in Britain. My favourite name, however, comes from the Iroquois: the Tree of Great Peace. According to their legends, the cluster of five needles, bound together, represented the five nations that made up the Iroquois, and the spreading roots that reached in all four compass directions were the roots of peace, extending to all peoples. Wow! Nice post. So informative and interesting with super photos. Festival of Trees, look out!!!! A wonderful post and pictures of my favorite conifer. I used to really get homesick for the long-needled white pine while in the northern fringe of the boreal in Alaska, where you had black spruce as the dominant species. Finally my wife embroidered a sprig of white pine needles on a brown wool shirt that I had, to remind me of the white pines that I missed. What is it about Eastern White Pine than so enthralls someone viewing a mature specimen,—–or better yet a stand of mature specimens. Their top branches in particular seem to be lifted up like arms in prayer, embracing the sun and sky. And when they’re upper crowns are exposed to strong prevailing winds, they appear windswept and deformed, or better yet, sculptured into interesting art forms. No two examples are alike. The forms change repeatedly as the tree or trees are viewed from different angles. Even the storm damaged specimens or interestingly attractive. I can think of no other conifer, or any tree for that matter that appears so regal and rustic.